The Mirage Junior Drum Kit 5-piece junior drum kit is a smaller version of a full 5-shell kit.. Straight out of the box you can be assured that your young aspiring drummer will have everything they need to begin playing and learning. 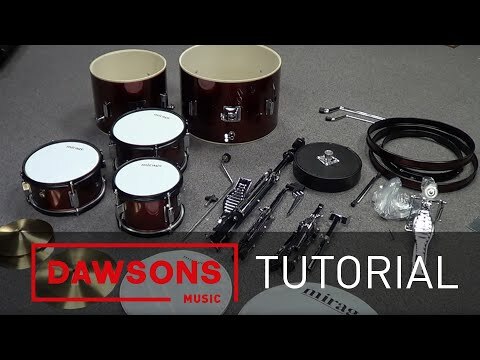 The easy-assemble design makes setting this kit up a very simple task, even for anyone that hasn't set their eyes on a drum kit before. The Mirage JDK comes complete with a wooden snare drum, 8" Hi-Hats, 2 Toms and a 10" crash cymbal. This gives the player all the core drums and cymbals they need to begin full practice with a drum kit as this set-up is not dissimilar to what professional drummers use. Further to this a stool, sticks and a drum key is also included! No need to buy add-ons and extras that can add to the cost, the Mirage JDK Junior Drum Kit really is a one-stop purchase to begin playing. Brilliant for beginner drummers and great value too! Ideal for ages 4 to 8 years. The Mirage JDK Junior Drum Kit in a delicious wine red is solid, easy to assemble and the complete package that you need to set your young one onto the road of becoming a future Neil Peart! For ages 9 and over we recommend a full size drum kit. Posted on 24/09/2014 by Pete Jarvis We got this for our son's birthday in February and he absolutely loves it! Having lessons and being fortunate enough to have a room that he can practice in, we thought why not. It's loud enough without disturbing the neighbours much and was easy to set up. It's great to hear him improve week on week and the kit seams plenty solid enough to keep him going until he outgrows it. I do recommend. Posted on 04/09/2012 by Poushal So my l'il fella happened to come across 'Tom Sawyer' by Rush while browsing for Tom Sawyer cartoons on youtube. He was immediately hooked by the 'mean mean stride' and begged for a guitar or a drumkit. Found this affordable set. The price was more than all right and the set looked decent (don't judge me, little children change hobbies quickly, what's the point of getting a Pearl). About the drum kit, the build quality is about right for the price and my neighbours would testify it does make the required sound level. Well, I am not a pro at judging drums but I felt the metal will be rusting soon and the auxiliary drums (really don't know what they are called) did not resonate as well as I would want it. Anyway, it is a good buy for a small kid to start drums on.